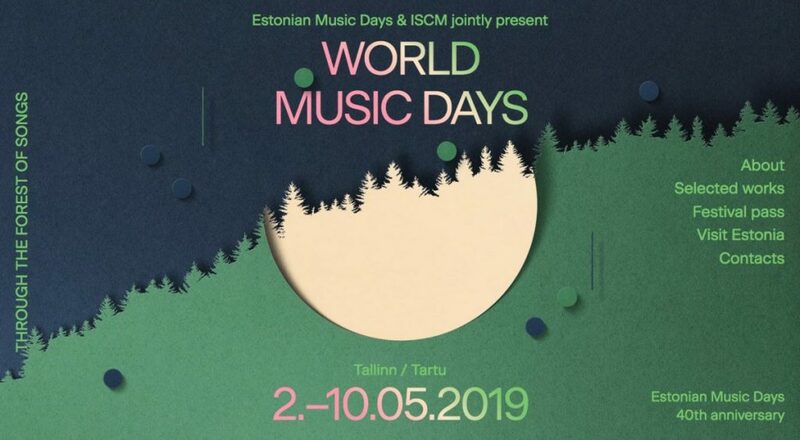 ISCM World Music Days in Estonia takes place in Tallinn between 2 and 10 May 2019. The festival in Tallinn focuses primarily on contemporary choral music in a wide variety of genres and styles and stimulates interdisciplinary cross-fertilization with architecture, theater, audiovisual art and literature. Nieuw Geneco (the Dutch Composers Association and ISCM Netherlands section) is proud that the ISCM jury selected no fewer than seven pieces by Dutch composers. The composers are very different. With her surrealistic orchestral piece Down the Rabbit Hole Mayke Nas pays tribute to Lewis Carroll and the Beatles. Alfred Momotenko-Levitsky reflects on the suffering of Christ in No Strastnoy for choir and a tolling church bell. Vanessa Lann, one of the most performed Dutch composers worldwide, honours Hildegard von Bingen in The Bird That Was Trapped Has Flown for solo soprano, female vocal ensemble, nyckelharpa and kokle, native instruments from the North. Jasna Veličković develops her own electro-acoustic instruments to create music from electromagnetic fields. She shows her latest results in Remote Me. Christiaan Richter travels to Tallinn with his solo percussion piece Droplets. With a complex interplay of different rhythmic cycles he mimics nature on just five metal objects. Bart de Vrees, a big name in new media and electronic music, presents For Flute or piano or mandolin or percussion or bassoon or guitar or clarinet or…….. A piece for any combination of instruments and video, childishly funny and eerily suspenseful. Vlad Chlek, a composition student from Tilburg, was inspired by Ingmar Bergman’s The Seventh Seal and composed Wood Painting for ensemble, in which each instrument is connected to one of the characters of the movie. We invite you to go Dutch in Tallinn!